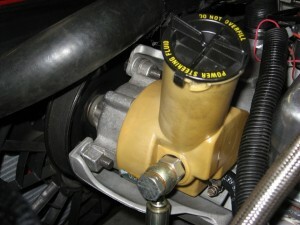 The Power Steering Pump is the heart of the Power Steering System and it needs to be functioning correctly. Below are some Technical tips to help maintain your Power Steering Pump and your Power Steering System. The Power Steering Fluid is the catalyst of all Power Steering systems without it you’re steering will not function correctly. We recommend that your Power Steering Fluid be changed every 40,000Klms or every 24 Months to keep the system working correctly and efficiently. Inside some power steering pump reservoirs the manufacturer fits a small inline filter these filters can get blocked with contaminates overtime, so they need to be removed and cleaned or replaced, the photo above shows a blocked filter on the left and a cleaned filter on the right . If they are blocked the pump will become noisy and the fluid can be forced out of the reservoir cap due to the blocked filter restricting the return fluid flow. The Video below show how to clean a "Steel" Toyota Reservoir. 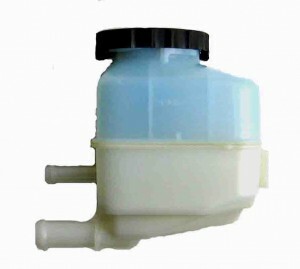 We stock a range to new reservoir’s and inline filters so please contact us to see if we have one for your application. 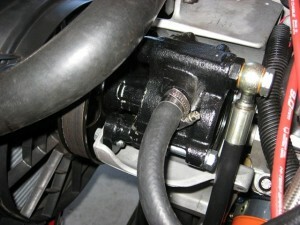 Most power steering pumps are driven by the engine via a drive belt to the pulley on the pump. These drive belts wear and the pump can lose drive, so the belt tension needs to be adjusted and checked regularly to maintain correct pump function. If the drive belt slips due to incorrect belt tension the pump will not function, this can result in complete loss of power steering. Please note the information we have supplied is intended to assist you in resolving some of the more common steering problems that can develop in power steering systems. We suggest that you refer to your Motor Mechanic, before performing any maintenance or repair to the steering system. 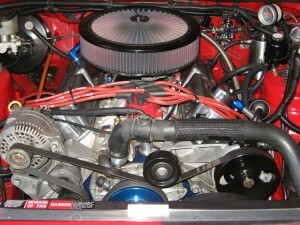 Ultimate Power Steering can modify Power Steering Pump flow rates to match each application. We have modified flow rates for Off-Road Racing vehicles that require higher than normal flow for this type of motorsport. We have achieved increases from 6Lts per min to 15Lts per min, this increase is needed to keep the Power Steering oil flow up to the large steering rams used on the Off-Road Racing vehicles. We have supplied Remanufactured Power Steering Pumps that we have converted for use in V8 Ford Falcon EA – EB Racing Cars. In this application the original C-2 Plastic Reservoir V8 Pump was extremely noisy, we have converted it over to a Saginaw pump with great success. To help us maintain the “Ultimate” in performance and quality of our steering units, we support our customers participating in different forms of motorsport. We believe that if our Steering Units can perform and excel in the harsh and very demanding forms of motorsport then all our customers can benefit, because the things we learn from our steering units used in motorsport we can implement into our everyday steering units.